Hearing protection is often overlooked in two of the places where it is needed the most: schools and hospitals. We aim to solve this problem by providing a wide range of hearing protection solutions for children and patients who must be protected from disturbing or dangerous noise. Here you will find many solutions for child hearing protection, which are ideal for students with special needs or high sensitivity to noise. 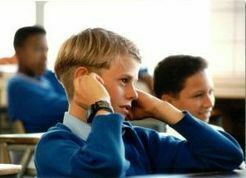 Too, any student may benefit from hearing protection during quiet study time or while test-taking, helping to enhance focus and eliminate distractions. For hospitals, we offer a good selection of MRI Safe Hearing Protection, from ear muffs to headphones for music listening. These products can enhance patients' comfort and protect their ears during intimidating MRI scans and other loud tests and procedures. We also have speech privacy and noise masking systems that are ideal for hospitals and clinics of all sizes, as well as sleeping solutions to make the stay much more comfortable for patients needing extended care. Schools and hospitals may also appreciate our custom imprinted ear plugs and cases, which are an excellent promotional item to give away to students, patients, parents, staff and visitors. Hearing protection for children, infants, toddlers, and babies. Ear muffs, ear plugs, and other ear protection solutions for kids. Also ear plug retaining swim headbands for children. Before you take your little ones out to concerts, ballgames, tractor pulls, or any loud event, be sure you have their tender little ears protected! We offer several ear muffs that are safe for use in and around MRI machines. These ear muffs are completely safe for use in and around MRI machines, and best of all, they are much less expensive than similar products sold by medical dispensers. NOTE: Virtually all foam earplugs and reusable industrial silicone earplugs are MRI Safe. Only those marked as "metal detectable" are known to cause problems when used in MRI machines. Hearing protection for dentists, dental assistants, and dental hygienists is critically important. High-speed dental drills, ultrasonic cleaners, and high speed turbine hand pieces are just a few potential hearing hazards. Fortunately, ear plugs present many excellent solutions for dentist hearing protection. Commercial noise masking & speech privacy systems are often the best solution when you want to protect the confidentiality of sensitive information being discussed in your facility, or just reduce the distraction of unwanted noise. We have systems to treat from a single cubicle to a huge call center. Noise masking is a terrific solution for sleeping in a noisy environment (such as with a snorer!) When used to protect the confidentiality of sensitive conversations, noise masking is generally called "speech privacy" instead. We offer machines made to address both of these important applications. From ear plugs to white noise to earphones for sleeping, you will find the peace you need to get a good night's sleep here. We also offer dedicated snoring relief solutions, as well as eye masks and other safe sleep aids. We offer the widest range of custom imprinted ear plug options available anywhere. We can add your logo to the ear plug packet, hot-stamp your logo on a durable ear plug case, choose the specific color of the ear plugs you want using a Pantone Chart, and even print your logo on the end of each ear plug. We even add your custom logo to just about any product we sell. As a float spa or sensory deprivation chamber owner or manager, you are probably already familiar with the most popular float spa ear plugs: Mack's Pillow Soft Silicone ear plugs. For multiple reasons, Mack's are hands-down the best ear plugs for use by float spa clients that we have found to date. We offer these excellent ear plugs in convenient dispensers of 200 individually packaged pairs that make it simple to give out to clients as needed.